What are those pesky Incense and Lure items for, anyway? Find out with our helpful guide! No doubt you're chugging along throughout the world looking for new Pokemon to add to your collection and more reasons to make Niantic's new sensation part of your daily routine. We're here for you with everything you need to know about Pokemon Go and the various things you can do within. If you're all about catching as many Pokemon as possible, you've no doubt checked out the special items you can use to bring Pokemon near you or your location: incense and lures. Which one is better to use in which situation and what do they do, exactly? This guide to using incense and lures at the right time should help clear things up for you. What is incense and how do I get it? Incense is an item that you can deploy to help attract Pokemon to you. It will attract any nearby Pokemon to you so you don't have to come to them. If you're not feeling walking around or venturing out into the world to catch these Pokemon or would rather get a cluster of them in an expedient manner, you'll want to use incense. 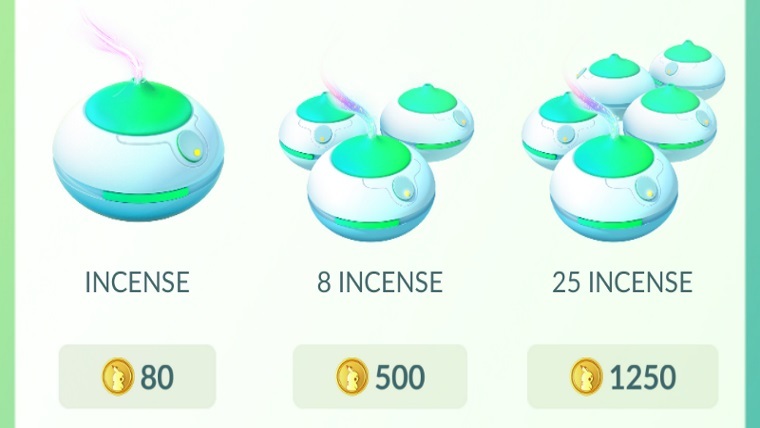 You can purchase incense via Pokecoins, which you can earn without spending any money at all. Check out our guide on how to earn Pokecoins without wasting a dime of real-world money here to see how you can stock up quickly. Once you've purchased the item from the main menu, it's as easy as accessing the menu via the bottom of the screen with the Poke Ball icon, selecting "Items," and using the incense at the top of the list. The incense will appear on your screen, but you haven't activated it yet. Tap it and it'll create a ball of gas around your avatar on the map, and there'll be a timer at the top right of your screen counting down to when the incense will expire. You get a decent amount of time, so don't worry about hurrying up things too much if you're looking to take your time. If you want to get as much out of it as possible, use an incense and take it on a walk with you to see what you can lure out of the bushes. You never know what you're going to find! What is a lure and how do I get it? Lures are special modules that you can place on locations like Poke Stops. They'll do exactly what their name implies and lure Pokemon to one central location for you and for others to start catching. If you leave the Poke Stop, the lure will still remain there and will benefit others who may visit. You can purchase lures with Pokecoins just like incense. Check back with the guide on how to amass Pokecoins without having to spend money to see how you can stock up on lures for you or your team (Team Valor all the way!). Which situations call for lures and which for incense? Think of incense as a special item that you can use for your own benefit so you can get Pokemon to follow you. It won't help a teammate or anyone around you. A lure is meant to aid everyone when it's deployed, even if it's not someone around you. So think twice about dropping it if you think enemy teammates are around somewhere who could benefit from having Pokemon attracted to a central location.